The study of the human body is fairly interesting. The moment it becomes no less than amazing is when we understand what happens as the body is placed under the demands of movement and resistance we call exercise. Rebounding is an effective exercise that reduces your body fat; firms your arms, legs, thighs, abdomen, and hips; increases your agility; strengthens your muscles overall; provides an aerobic effect for your cardiopulmonary systems; rejuvenates your body when it's tired, and generally puts you in a state of mental and physical wellness. What's all the Rebounder Sale Fuss About? 1. Rebounding provides an increased G-force (gravitational load), which strengthens the musculoskeletal systems. 2. Rebounding protects the joints from the chronic fatigue and impact delivered by exercising on hard surfaces. 3. Rebounding helps manage body composition and improves muscle-to-fat ratio. 4. 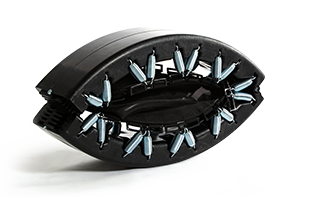 Rebounding aids lymphatic circulation by stimulating the millions of one-way valves in the lymphatic system. 5. Rebounding circulates more oxygen to the tissues. 6. Rebounding establishes a better equilibrium between the oxygen required by the tissues and the oxygen made available. 7. Rebounding increases capacity for respiration. 8. Rebounding tends to reduce the height to which the arterial pressures rise during exertion. 9. Rebounding lessens the time during which blood pressure remains abnormal after severe activity. 10. Rebounding assists in the rehabilitation of a heart problem. 11. Rebounding increases the functional activity of the red bone marrow in the production of red blood cells. 12. Rebounding improves resting metabolic rate so that more calories are burned for hours after exercise. 13. Rebounding causes muscles to perform work in moving fluids through the body to lighten the heart's load. 14. Rebounding decreases the volume of blood pooling in the veins of the cardiovascular system preventing chronic edema. 15. Rebounding encourages collateral circulation by increasing the capillary count in the muscles and decreasing the distance between the capillaries and the target cells. 16. Rebounding strengthens the heart and other muscles in the body so that they work more efficiently. 17. Rebounding allows the resting heart to beat less often. 18. Rebounding lowers circulating cholesterol and triglyceride levels. 19. Rebounding lowers low-density lipoprotein (bad) in the blood and increases high-density lipoprotein (good) holding off the incidence of coronary artery disease. 20. Rebounding promotes tissue repair. 21. Rebounding for longer than 20 minutes at a moderate intensity increases the mitochondria count within the muscle cells, essential for endurance. 22. Rebounding adds to the alkaline reserve of the body, which may be of significance in an emergency requiring prolonged effort. 23. Rebounding improves coordination between the propreoceptors in the joints, the transmission of nerve impulses to and from the brain, transmission of nerve impulses and responsiveness of the muscle fibers. 24. Rebounding improves the brain’s responsiveness to the vestibular apparatus within the inner ear, thus improving balance. 25. Rebounding offers relief from neck and back pains, headaches, and other pain caused by lack of exercise. 26. Rebounding enhances digestion and elimination processes. 27. Rebounding allows for deeper and easier relaxation and sleep. 28. Rebounding results in better mental performance, with keener learning processes. 29. Rebounding curtails fatigue and menstrual discomfort for women. 30. Rebounding minimizes the number of colds, allergies, digestive disturbances, and abdominal problems. 31. Rebounding tends to slow down atrophy in the aging process. 32. Rebounding is an effective modality by which the user gains a sense of control and an improved self image. 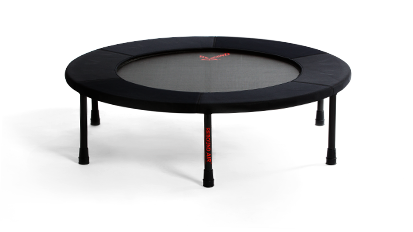 Highest caliber, wide belly springs creating the "Soft Bounce" characteristic of the ReboundAIR™. Larger, longer and stronger than competitor brands. double sided reinforced circumference bands. The highest standard of quality for years of regular use. Legs unlock and fold for storage. The most innovative, safe, durable hinges on the planet . . . accept no imitations! Lifetime All-Component Warranty, up to 300 lb. user weight. Folding models come with a FREE good looking carrying case! 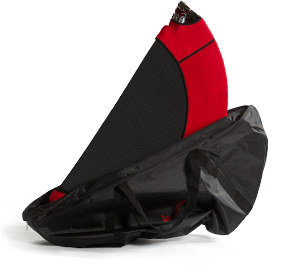 Our best selling Half-Fold option makes this rebounder easy to fold up, carry and store. The safe, innovative, exclusive hinges are covered under the same lifetime warranty as the springs, mat and frame. Our famous All-Component Lifetime Warranty and Free Wear and Tear Replacement is included. You will absolutely love the softer, more resilient bounce technology featuring our wide belly, high caliber springs. Constructed with the best materials available at the highest level of workmanship. No assembly required. A helpful owner's manual is also included. Stronger and lighter than metal frames. No Assembly Required Full 40" diameter Health club quality at an in-home price. Excellent for demonstrations, traveling physical therapists or for those who want the state-of-the-art of Rebound Exercise equipment. Built to last decades of regular use. There is no need for a spring cover! The high caliber, wide belly springs are protected and integrated in the frame itself! Aggressively tested at 300 lb user weight. However, the lifetime warranty covers all components for all users up to 400 lb on this Quarter Fold model, The Ultimate Rebound™. Our famous All-Component Lifetime Warranty and Free Wear and Tear Replacement is included. Be sure to pick up our unique stabilizing bar to expand your range of exercises and give additional balance. Excellent for rehabilitation, children, first-timers, elderly, disabled, blind or for those who want to get crazy with high kicks! Easy to assemble. Fun for all bouncers!